Sydney turned on the charm for my recent trip to Australia’s harbour city and I thoroughly enjoyed every minute I spent installing the latest three FAB Docks. And three of the nicest people I have ever met who will fit perfectly into our rapidly expanding FAB Dock family. Adam and his 265 Sea Ray was first. One of the best small cruising boats built. It has everything you would need for a group of friends to spend a leisurely day on the Harbour or a romantic evening for two under the stars. 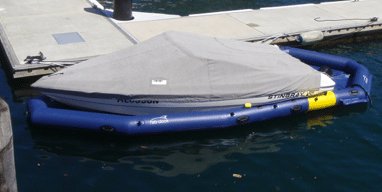 And now that Adam has it safely tucked into a FAB Dock, he promises me he will use it a lot more. Between a busy work schedule and the drama of having to berth it in a difficult spot, Adam admitted that he hadn’t driven it in a year and a half. 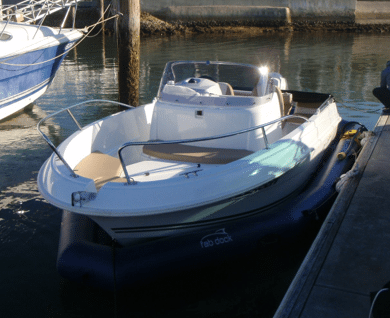 After a few demonstrations on just how easy it is to park his boat singlehandedly, he quickly realised that he will be putting his investment to a lot better use this summer. He even admitted to not believing my claim that you can actually park your boat with your eyes closed once you had the bow between the yellow markers, but he does now. Then it was off to protect Milad’s latest toy. And what a toy it is. If you are in the market for a new runabout, you have to check out this new Cap Camarat 5.5 from Beneteau. It is a ripper. And it looked so cute next to the 45 foot Beneteau Flybridge that Milad nonchalantly explained later was also his. After getting him to waste half an hour of his time showing me his ‘other’ boat, I spent the next two hours trying to weasel an invitation on his next Harbour cruise. How did I go Milad? Anyway, we got his new Beneteau tucked away nicely into its FAB Dock after finishing off some of the delivery details that the dealer had overlooked. Obviously, only owning two Beneteaus doesn’t entitle you to gold star service.